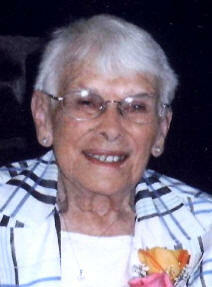 Eunice W. (Park) Orem Bernard – a former resident of Portland, passed away on Friday, July 9, 2010 at the home of her son. She was 101 years old. Graveside Inurnment will be held at 10:00 AM on Saturday, August 14th, 2010 the Adams Cemetery in Molalla, Oregon. Contributions in memory of Eunice may be made to St. Anthony Hospice, and may be sent directly or in care of Burns Mortuary of Pendleton, PO Box 489, Pendleton, OR 97801. Send condolences to the family and sign the online guestbook at www.burnsmortuary.com Burns Mortuary of Pendleton is in charge of arrangements. Eunice was born on July 6, 1909 in Minnesota Lake, Minnesota, to Robert J. and Mary Grace (Hartley) Park. She moved with her parents to Centralia, Washington in 1914. A year later the family moved to Molalla, where her father opened the Lyric Theatre and Pool Hall. Eunice attended schools in Molalla. She met and married Glen T. Orem in March of 1927 in Union Mills, Oregon. After her husband's death in 1957 she went to work as a secretary at Edmarks Insurance in Molalla. She had remained working there until her retirement. She married Hubert Bernard in 1962. He preceded her in death in August of 1977. Eunice then moved to Cove, OR and lived with her daughter until moving to Prineville, near her son. She later moved to Portland, again living with her daughter. She was a member of the Christian Church, and belonged to the Christian Church in Molalla for many years. Eunice was a Past Matron Orchid Chapter OES, Molalla, OR, and Past Matron Cherry Chapters OES, Cove, OR. Her hobbies included fishing with her late husbands, camping, traveling to Parke Society Conventions (Genealogical Society). The family threw a huge 100th birthday party a year ago at the Multnomah Falls Lodge attended by 100 friends and relatives. She continued to work crossword puzzles even when she was over 100 years old. She was also still an avid reader, devouring books, newspapers and magazines. Eunice is survived by her children; Lyle & Adele Orem of Pendleton, OR, and Raymond Orem of Prineville, OR, and Marjorie Eggimann of Portland, OR, a sister Mrs. F.A. (Jean) Woods of Portland, OR, as well as 8 grandchildren, 26 great-grandchildren and 25 great-great grandchildren. She was preceded in death by her parents, two husbands, two brothers, a sister, a daughter-in-law, two sons-in-law and a granddaughter.